Is there any reason the Thenns have these lines on their heads? I don't remember if they were mentioned on the books. I remember that Styr was clean shaven and bald, but did he have these lines? The lines on their heads in that image are caused by ritual scarification, a practice similar to the self-immolation practice of the burned men. However, in the books the Thenn do not engage in this practice. 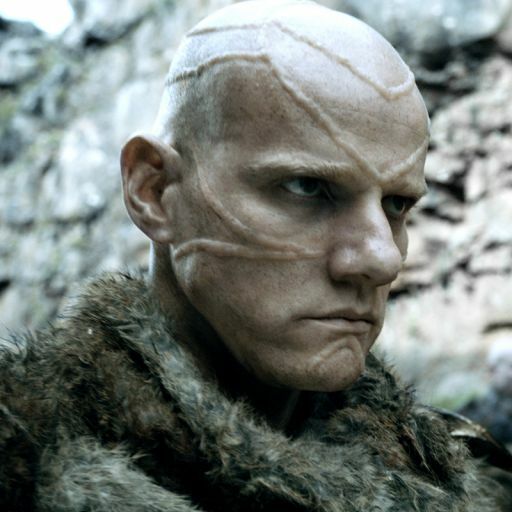 In general, the books portray the Thenn as the most "civilized" of the wildlings, since they have an established nobility and more advanced technologies like metallurgy. On the other hand the TV show has chosen to portray them as another barbaric group. Probably this was out of a desire to have visually refreshing antagonists. According to the wikia on the Thenns this is down to a ritual. Thenns also shave their heads bald and engage in self-scarification as well as cannibalism, feasting on the flesh of their enemies. However, this is not the case in the books where the Thenns are the most civilised wildling clan (although still true in the show) and aren't cannibals and don't do ritual scarification. They appear to be a merge of the Thenns with the ice-river clans who are cannibals but again no mention is made of them performing any rituals. And there were folks fiercer even than Varamyr, from the northernmost reaches of the haunted forest, the hidden valleys of the Frostfangs, and even queerer places: the men of the Frozen Shore who rode in chariots made of walrus bones pulled along by packs of savage dogs, the terrible ice-river clans who were said to feast on human flesh, the cave dwellers with their faces dyed blue and purple and green. With his own eyes Jon had beheld the Hornfoot men trotting along in column on bare soles as hard as boiled leather. He had not seen any snarks or grumpkins, but for all he knew Tormund would be having some to supper. Why did the show cut out these character arcs in season 5? Does the Faith Militant use laws retroactively? Does anyone ever acknowledge the hypocrisy of their scorn for the Kingslayer? Why are these members of the Brotherhood detained at Eastwatch-by-the-Sea?